Noel Mewton-Wood's recording career began when he was just eighteen years old, initially as accompanist to the child prodigy violinist, Ida Haendel, then aged just twelve. You might expect these recordings to exhibit some indication of nervousness or immaturity but no, they're assured, finely-nuanced performances, and all from first takes. Mewton-Wood went on later that year to commence a number of solo recordings, also for Decca - clearly he'd impressed them sufficiently in the studio with Haendel. A note about the dates here - we initially checked with the British Library, whose database gives a 1940 recording date for the Albéniz, and it was this which determined the running order for this release. However, further research indicates that the recording date was actually a little later, as shown above. It should be noted that we also found another source suggesting 1942 for the same recording, though this seems unlikely. 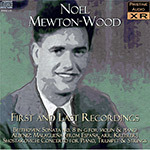 Mewton-Wood's final recording is a scorcher - by this stage the now 30-year-old pianist had made a number of major recordings with Goehr and an assortment of European orchestras operating under a variety of names, but in many cases assembled for recordings such as these from various radio orchestras and the like. Harry Sevenstern, the trumpet soloist on this recording, was a regular in recordings credited to the 'Netherlands Philharmonic Orchestra', a recording outfit made up of players from several Dutch radio orchestras. Regular recording venues for this orchestra were primarily the Hersteld Apostolische Kerk, a church building at the Johannes Geradtsweg in Hilversum, or if this was not available, the recording sessions took place in the Tesselschadekerk. Harry Sevenstern, trumpet, Concert Hall Society Symphony Orchestra, cond. Walter Goehr.